(From Sigma Lens literature) The Sigma Corporation is pleased to announce the launch of the new APO 50-150mm ƒ/2.8 II EX DC HSM lens. This large aperture telephoto zoom lens is designed exclusively for digital SLR cameras with APS-C size sensors and its compact, lightweight body provides freedom of movement and versatility. 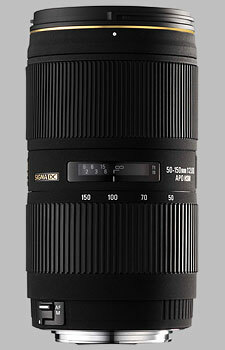 The Sigma 50-150mm ƒ/2.8 II, announced in December 2007, is an update to its previous 50-150mm ƒ/2.8. It's hard to tell exactly what has been updated: comparing the specifications of the two lenses, they appear almost exactly identical, except version II seems to have shaved off 8mm from the overall length. The difference appears to be in the mount options, as Sigma has made HSM-style versions available for the previously unsupported Pentax and Sony lens mounts. This is good and bad news: while the lens will mount on those bodies, if the body only supports mechanical (screw-driven) style focusing, autofocus will be unavailable. Newer Pentax and Sony bodies will support the HSM standard. The 50-150mm ƒ/2.8 was and remains a ''designed-for-digital'' lens, with an imaging circle that only covers the APS-C sensor. In this capacity it will provide a field of view equivalent to 75-225mm on a Nikon, Pentax or Sony body, and 80-240mm on a Canon body. Technically, the lens will mount on a film or full-frame body, but circular vignetting will be visible from 50-100mm, and extreme corner darkening is visible from 100-150mm. 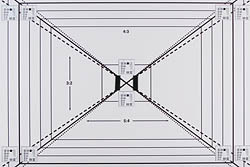 As well, the lens doesn't have an aperture ring, meaning your film body will have to be able to set lens apertures to operate the lens completely. The lens takes 67mm filters, comes with a standard round lens hood, and is available now for around $700. Our sample copy of the 50-150mm ƒ/2.8 II appears to be slightly de-centered. For this copy, optimal image sharpness is achieved with the lens set at 70-100mm and ƒ/5.6-11. If I'm right about the de-centering, a better copy would provide excellent results at ƒ/4, too. I'd suggest that large-aperture lenses are shot the majority of time at their largest aperture, so let's look at that performance. Set to 50mm, our copy shows its de-centered imperfections, but the sweet spot of sharpness is quite substantial - about half the left side of the frame. Corner softening is fairly well-controlled, reaching 4+ blur units. Zooming in to 70mm and your sweet spot diminishes slightly, but corner softness does as well. At 100mm our sharpness pattern is the opposite to the 50mm results, with the de-centering putting the sharpness sweet spot on the right side, and more pronounced corner softness is evident. At 150mm, image sharpness is reduced overall (2 blur units) with some corner softness. Even on this copy of the lens image sharpness improves dramatically stopping down to just ƒ/4, and by ƒ/5.6 image sharpness is almost at its peak. Image sharpness at ƒ/8 and ƒ/11 is optimal, tack-sharp across the entire frame, and diffraction limiting sets in at ƒ/16-ƒ/22. Even fully stopped down at ƒ/22 image sharpness is good, uniform across the frame, at 3 blur units. I think a properly centered copy of this lens would show off its strengths, though even this copy does well. The lens shows excellent resistance to chromatic aberration in the wider range of its focal length spectrum, and at larger apertures. Between 50-70mm CA is virtually non-existent. At 100mm, CA starts to become statistically noteworthy (though you still might have to peep pretty hard to detect it), and the lens shows off its worst results at 150mm and stopped down greater than ƒ/4. Considering this lens will see most of its usage ƒ/2.8, it's nice to see that performance has been optimized for that setting. The 50-150mm ƒ/2.8 II does have some small issues with corner darkening, visible predominantly at telephoto focal length settings (100-150mm) and at larger apertures. Worst case settings are 150mm and ƒ/2.8, where the corners are almost three-quarters of a stop darker than the center. By ƒ/5.6 corner shading is a quarter stop darker or less, and by ƒ/11 corner shading is non-existent at all focal lengths and apertures. 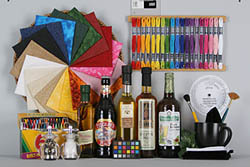 The lens is designed fairly well to produce a relatively undistorted image, though if you're looking for straight lines, you will have some slight complexity. Between 65-70mm the lens produces practically undistorted images. Wider than 65mm and you have images with slight barrel distortion (0.3% max, in the corners), but the distortion here is uncomplicated and can be corrected easily in image post-processing software. Above 70mm however, there is a mix of very slight barrel distortion in the center of the image, and gradually increasing pincushion distortion in the corners. Pincushion distortion reaches -0.5% at 150mm while barrel reaches 0.2%, meaning a simple correction for one will enhance the other. Built with Sigma's HSM specification, focus is conducted hypersonically, meaning it is very fast and virtually silent. If you're using a compatible body, that is: if your SLR body doesn't support HSM, it won't autofocus at all. There are better lenses for macro work, as evidenced by the lens' poor magnification ratio: just 0.19x. That said, close-focusing distance is fairly good, at 100cm (3' 3''). The Sigma 50-150mm ƒ/2.8 II is a solid lens, well-built with a metal lens mount and wide zoom and focusing rings. The lens has a great texturized finish which speaks to its build quality, however, as mentioned our sample copy appears to have one or more de-centered lens elements, so I'd advise doing some formal or informal testing to make sure you're getting the most out of your lens. My own experience with Sigma warranty work has been excellent. The lens sports a few higher-quality features, such as a recessed distance scale covered by a glass plate, internal focusing and a nine-bladed diaphragm. The zoom and focus rings are the same width (1 1/4'', 32mm) but the rubber ridge texture is spaced slightly closer on the focus ring. As both zoom and focus operations are conducted internally, there's no possibility of zoom creep. The zoom ring travels smoothly about 70 degrees through its entire zoom range, which is spaced in linear increments of 50, 70, 100 and 150mm. As an HSM-style lens, autofocus can be overriden at any time by just turning the focus ring, or disabled on the lens by flicking a dedicated switch to ''M.'' There is plenty of travel on the manual focus ring, about a quarter-turn, and the ring itself is nicely cammed to provide smooth resistance. The filter ring is a hard plastic, and accepts 67mm filters that won't rotate during focusing or zooming. The lens hood is fairly sizeable, adding another 30% of length to the overall package, and is as nicely texturized as the lens. The lens hood reverses for storage and makes manual focusing impossible, but the zoom ring is still accessible. The more popular lens manufacturers don't produce a lens in this focal length range, with the notable exception of Pentax. All manufacturers produce a 70-200mm or 80-200mm which would be the closest comparison, but then we'd have a whole other article comparing those lenses to this one. I'll restrict my suggestions to a just a few. We haven't tested the original version of this lens, but with the exact same specifications, I would wager you would see the same optical performance. Obviously, this won't be an option if you're a Pentax or Sony user. The user reviews for this lens are unanimously positive. Slightly more expensive but a bit more telephoto, Sigma's comparable to the major manufacturers' sports zoom tested very well, and is available for all mounts. It covers a full 35mm frame, and the latest version of this lens is designed with a macro component offering 0.29x magnfication. Pentax offers a newer lens with about the same focal length range, just slightly more expensive but about as good as you can get if you're shooting Pentax. We haven't reviewed this offering from Tokina, but it's an option if you're shooting Nikon or Canon, with comparable vital statistics to the Sigma but slightly less telephoto capability. With the big caveat that you want to ensure you have a good-quality sample, I'm impressed with the results presented by the Sigma 50-150mm ƒ/2.8 II. Its optical quality, marred only by de-centered lens element(s) in this copy, is very good. Build quality and overall construction is also admirable. I don't know if there's any pressing need to upgrade from the previous version of the lens, as version II just seems to open the field to Pentax and Sony SLR users. If you're looking for a less expensive alternative to the major manufacturers' 70-200mm offerings, this lens definitely bears consideration. Bought my copy new in 2010 from B&H just before they went out of stock. Would have liked the Pentax 50 -135mm but that was just too expensive in New Zealand. Also worried about the reported SDM failure rate with the Pentax. Unlike the tested copy here, mine is almost perfect at 50mm straight from F2.8 (as good as my Pentax A50 F1.7mm prime). Progressively softens off towards the top right hand corner as it is zoomed out. Worst at 150mm but still correctable by stopping down to F8. From 70mm to 100mm, F5.6 - F6.7 is needed to sharpen up the corner. However centre sharpness at F2.8 at all zoom lengths is very good, very useable. Distortion is also minor and correctable. Used on 4 different bodies but now lives permanently on a K30 - no focusing issues at all on that body. Fast, silent, reliable and almost 100% accurate. I have been very satisfied with this lens. It's a great street lens. I agree with Andrews caveat -- make sure you have a good copy before you buy. My copy of this lens (in Canon fit) was let down by a consistent failure of the autofocus motor in the lens. I had to send it back to Sigma twice to be fixed. And I do not use the lens much. They did fix the lens quickly, but I do not expect 2 failures in such an expensive product. Great range, easy handling, nice looking build, quick focus. Very soft from f2.8-f4, never gets tack sharp, lots of CA, not consistant in focus accuracy. I had the highest hopes for this new version of the Sigma 50-150mm HSM II, I really needed the range and a fast f2.8 ability. I guessed i would need to stop the Sigma down at 150mm to get sharpness, put you really have to stop this lens down a lot, at every focal length to get results you can be proud of. Sadly, my Nikon 55-200mm VR starter zoom is sharper at every focal length and every aperture..YES, the Nikon 55-200mm is sharper, focuses about the same speed ( the Nikon, hits the target more often), the Nikon has better contrast and color too...yes, I sent the Sigma back. I was told by 47th street photo on the phone, that they thought the lens was defective. Once the Sigma arrived at 47th street photo they told me their tech tested it and it was "fine without issues". Of course I am still fighting to get me refund from 47th street (I should have purchased from Adorama or B&H!!). Maybe the 50-150mm III will get it right. I picked up a used Nikon 80-200mm f2.8 ED today, the Nikon looks great stopped down to f3.5 and is built like a tank! Save your time/hassle and just pick up a Nikon zoom in this range...I only wish the Nikon was as light as the Sigma, nothing more. My only real issue with the image quality is a type of CA which occurs most noticeably around OOF areas when stopped down, as it is not correctable via normal means. The lens exhibits very little CA in areas which are in focus. There is a bit of vignetting at the long end, but that is easily correctable. Distortion is usually not a significant issue. The HSM is true ring-type, super quick and quiet. The lens is built very nicely, like a solid block, and both control rings are wide and nicely damped. This is the best manual-focus AF lens I've owned.